Location: End of Cemetery Drive, Section 6E, Township 5N (Rice), Range ióE, Sandusky County, Ohio. Take SR 53 north of Fremont about 4-1/2 mile to CR 129 (Fisher Rd). Turn right (east) on CR 129 and go 7/10 mile to Cemetery Drive. Turn south (right). 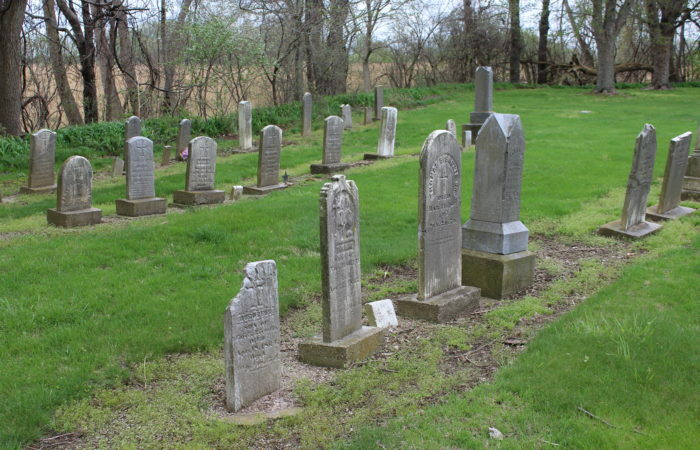 The cemetery is at the end of a lane along the Sandusky River. There is a sign but the cemetery is not easily seen from the road in the summer. A migrant camp is situated in front of it. It had been in poor condition until a few years ago when interested citizens fixed it up. Now the township maintains the cemetery. The following is excerpted from the October 1993 issue of Family Times. 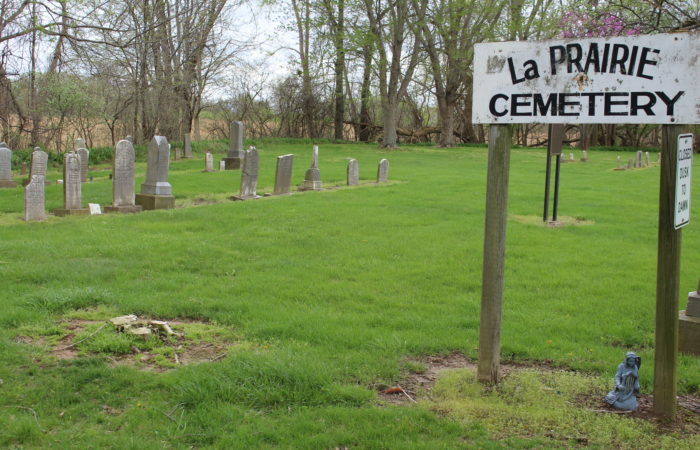 “The history of the cemetery begins with a family farm located at the bend of the river. 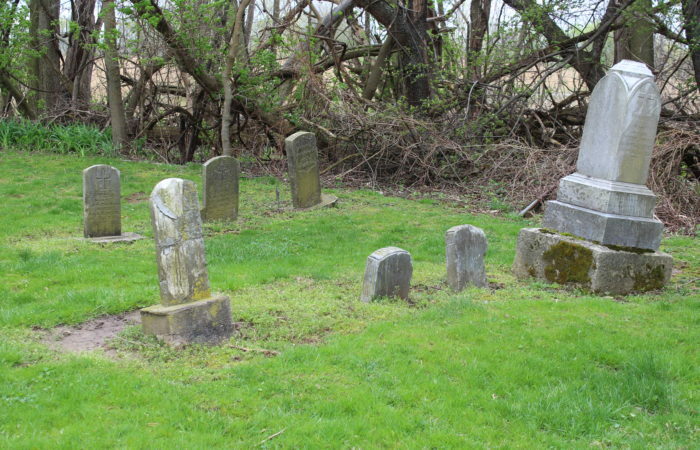 Everett (writer of 1882 Sandusky County History) notes that Paschul (died 1839) and Angela Bissonnete were buried in a family cemetery near the site of the family’s log cabin home. Because all of the French settlers in Rice township were Catholic and in need of a permanent place of worship, they erected St. Philomena Church in 1841, reportedly the first Catholic church in Sandusky County. 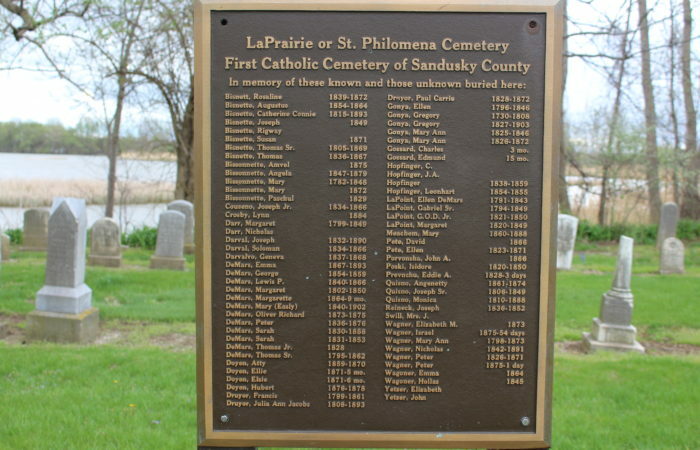 Everett indicates in his history that St. Philomena occupied a “bank of the Sandusky River with a lot of ground set apart for burying purposes.” Later, he adds that “a cemetery beautifully located on the bank of the river marks the site of the old church. By 1870, a new church was built in the center of the township where it served the local Catholic congregation until 1913 when it was finally abandoned. According to the Deed Abstracts at the Sandusky County Courthouse the Bisonette & Gonya families turned over 3 acres of land in this location to Bishop Amadaeus Rappe of the Diocese of Cleveland in 1851. A large plaque bears the names of those buried in LaPrairie.